Throughout this period, jazz came in two more or less exclusive types - ‘revivalist’, which sought to recreate the classic jazz of the 1920s, and modern. Enthusiasts on both sides regarded their music as being more important than mere entertainment. In it they found a quality which they defined vaguely as ‘honesty’ or ‘sincerity’, which may perhaps be summed up as ‘authenticity’. I want to say how much I enjoyed Dave Gelly’s book. It’s well-written, gives an intelligent and informative summary of the period concerned, and is short and to the point, something to be welcomed in an age when big books seem to be taking over. It has a number of entertaining anecdotes, and there are relevant notes, a short but sufficient for the purpose bibliography, and a useful guide to available CDs. I’d recommend An Unholy Row to anyone wanting a brisk account of jazz in Britain in the 1940s and 1950s. Humphrey Lyttelton, John Dankworth, Tubby Hayes, Ronnie Scott and Joe Harriott and just a few of the eminent names scattered throughout the absorbing text of this neat and fairly slim volume written by Dave Gelly - a venerable scribe whose own stalwart endeavours have woven him into the UK jazz tapestry. Gelly's account is naturally an analytically perceptive one, not least when it comes to handling the different hues of 'jazz' - such an all-embracing word. 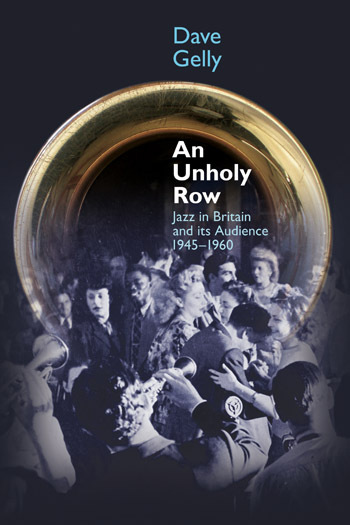 I enjoyed reading writer / musician Dave Gelly’s AN UNHOLY ROW: JAZZ IN BRITAIN AND ITS AUDIENCE 1945-1960 all the way through. I am a difficult audience for most books of jazz history that propose to cover a period of the music in a larger context (as opposed to a biography or autobiography). Gelly’s quick-moving book has many good stories in it, covering those intense years in 167 pages, but his tales are all wisely connected. I am now a Gelly convert, and want to read his other books. I predict you will, too.